Roland UA-55 Quad-Capture USB Audio/Midi Interface This small portable audio interface has been concieved for professional results and opti.. This small portable audio interface has been concieved for professional results and optimal audio recording capture. Whether your recording at home using a Desktop PC in your project studio or you are out and about on a Laptop recording on location, this is perfect for the job. With a pair of phantom powered XLR/TRS inputs means you can plug an XLR (Microphone Cable) or 1/4 Inch (Instrument Cable) directly into the UA55. Ideal for recording a guitar and vocal or even two guitars at once. The Hi-Z TRS inputs make the UA-55 perfect for recording natural guitar tone directly into your DAW where you can then begin to add your Effects and EQ for an amazing professional sound. A great feature of the tough little Roland UA55 is the Auto Sens function which allows the user to set input levels at the push of a button. You plug and play your connected instruments, and at the push of the button, the QUAD-CAPTURE automatically sets the ideal recording level for each input. This is amazing for quick recordings when creativity strikes.This gives you peace of mind that every subtle nuance of your performance is faithfully captured. It also has very low signal to noise ratio meaning that anything you record comes through as clean as possible to your DAW. The UA-55 also runs on USB bus power meaning your computer does all the leg work and you're not carrying around bulky power supplies. It also has headphone outs for you to record and monitor back in silence. 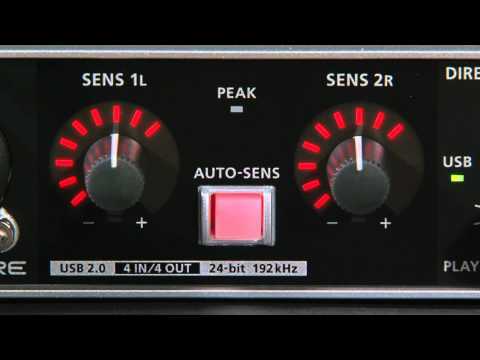 Its rear panel MIDI input/outputs means that this can be connected to your favourite Midi Controller and DAW making this the hub or your entire recording studio. Its tough, roadworthy and its strong aluminium casing will protect all that lies within, leaving you peace of mind that this will never let you down. Its compact size can be easily intergrated into any kind of project/mobile recording setup taking up minimal room. The Quad-Capture also has big brother in the Roland Octa-Capture which has all the same features and functions as its little brother, but has 8 XLR/TRS Inputs and much more. This product replaces the discontinued Edirol UA-25EX USB Audio Interface.